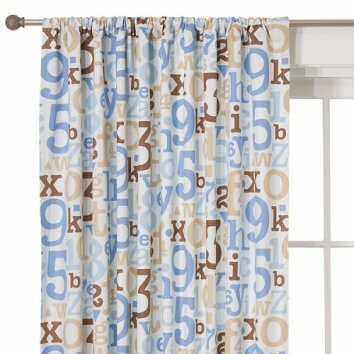 I just bought two of these curtain panels from Target. They are going to be a dress. Seriously, I'm not even kidding. Two panels should be about four yards @ 44" wide. I would have purchased three, but that's a little pricey. What with shipping and all it's about $10/yard, but I don't care, my jones for alphabet-print fabric in perfect colorways knows no bounds. Supposedly this is a nursery pattern, but again, see me with the not-caring. What's the downside of making a dress from this? Small children will find me strangely comforting? There's a really lovely pink kind of cattail-ish print, as well, that would be just as nice for a grown-up girl (or retro boy) as it is for an infant. I draw the line, though, at transforming the changing-table cover into a hat. "This gives the gown a whimsical quality." Seriously…I love the fabric…colour, print…everything! Please post a pic of you in the finished product! Just FYI, all that stuff is on sale at Target this week. And you can get free shipping from the website with a minimum purchase. They have some really cool prints… the one with circles is particularly fetching. Excellent!! !Not for me on many counts (not able to sew these days, not ‘allowed’ to buy any more fabric and no Target in UK) but I live vicariously through you! I loved the article in Craft. And what a great tip on the Target fabric. Curtains are great! I have a set of Ikea curtain panels waiting to be made into a summer dress. Lovely black-on-white block print, looks very Indian. Now what you should do is have a contest where you can only use shower curtains from a store like Dollar General and see who can devise the best looking frock.If any of you are any good at all, I am sure you can whip together some funky looking outfits. Why make Target any richer than they are ? Awesome, awesome, AWESOME! You’ve gone all Scarlett O’Hara on us, making a dress out of curtains! 😛 Can’t wait to see what the finished product looks like. Miss Kitty beat me to the line–Miss Scarlett, don’t you be doing that with your mama’s portieres!! Your dress will be at least as fabulous! Please post the results! Well done! I wholly approve. Not that you need it. oooo! I have a wrap skirt I made out of a table cloth! one of the best skirts I ever made in fact! Well, I for one, can’t wait to see the finished product. This is very nifty fabric! The linked article about color and gender is quite interesting. Who says little girls can’t wear blue, or household objects can’t be transformed, or that we should stick to standard abstract prints? To them we say “Poooie!” and don our favorite unique attire! Hooray! …you saw it in the window and just had to have it? /Old Carol Burnett jokeBut seriously, those panels will make a wonderful dress. I think I’d like them more as a dress than curtains! So glad to know I’m in such good company— check out urbanoutfitters.com for some curtains that beg to be worn! There’s a page in the new March Lucky magazine of a “trend in the making” of typography. There’s a lovely Vena Cava dress and a very cool top that I want by a company new to me, Makool.